Gift Horse is a giant Trojan Horse stuffed with paper virus sculptures, which were built at the 2010 01SJ Biennial and then 'gifted' to the San Jose Museum of Art in a public ceremony on September 18th, 2010. The Gift Horse project is a unique media spectacle, a fun public collaboration and a celebration of the viral nature of art and ideas. The Trojan Horse was first built as a 3D model in the virtual world of Second Life. From this design we built the large-scale version of the horse to resemble a digital model in the real world. Both the interior armature and the exterior panels were output from the computer model and cut with a computer-controlled router to retain the original geometry. The interior armature of the horse is constructed from wood, while the exterior is clad with pixilated wood textures on biodegradable board printed with chemical-free inks. Gift Horse was presented at the 2010 San Jose Biennial (01SJ), North America’s newest and largest festival of digital arts, from September 14th-18th, 2010. Based on the theme Build Your Own World, the festival offered a view of a world in which artist’s, designers and citizens imagine and build alternative futures through various ecological, social and technological art projects. We built Gift Horse to inspire others to create using environmentally friendly building techniques and materials. From September 4th-14th, we assembled Gift Horse in the 80,000 sq. foot South Hall warehouse in downtown San Jose, alongside numerous projects, by artists and designers, all open to the public. Everyone was invited to collaborate with us and make a paper-craft sculpture depicting a real or imaginary virus. After each person finished their virus sculpture, they placed it inside the belly of the giant Trojan Horse. On September 18th, 2010, Greek warriors pulled the Trojan Horse through the streets of San Jose during ZERO1’s Green Prix parade. Afterwards, Gift Horse was wheeled to the San Jose Museum of Art for a boisterous public ceremony and media event where the horse was “gifted” to the museum. 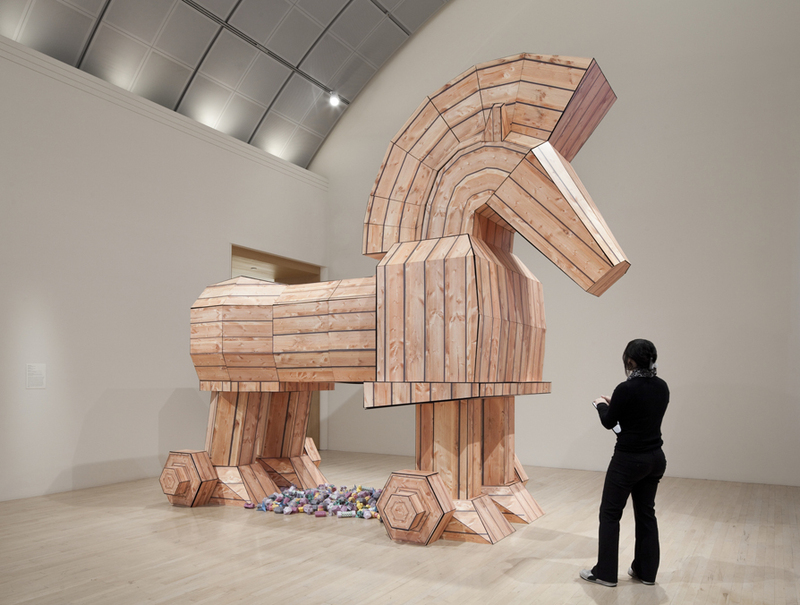 In a finale, a trap door in the belly of the horse was opened to release hundreds of the public’s colorful paper-craft virus artworks onto the museum floor. Gift Horse and the viruses were installed in the museum as part of the exhibition Retro-Tech following the Biennial until February 2011.